Shinjitsu's first name is probably a reference to the fact that she doesn't sugar coat anything. She's very truthful, even if it hurts. Her last name, Hanran, is most likely in relation to her sort of rebellious looking appearance. Shinji is just a shortened version of her real name. There's no importance or particularly good reason behind the nickname. This is also her most commonly used nickname. HanHan is a cutesy nickname she was tagged with in grade school. She had a pretty cold and irritated personality, so the cutesy nickname was stuck on her as more of a irritating sort of thing. Personality: Altogether, Shinji appears to be a generally sardonic. To anyone who doesn't know her, she appears sarcastic, dark, and rude. This is useful when she has to deal with Yuhei's fangirls who try to and reach him through her. She's very blunt to the point of being downright taunting. Shinji is pretty intelligent and witty when she needs to be, and has a good understanding of the world around her and how it works. When she's with friends or clients however, her attitude shifts from that of a sardonic sarcastic stick in the mud to a warmer side, though the sarcasm still stays. She's much more humorous and good natured around people she knows, which isn't many since she appears intimidating and cold upon fist glance. Shinjitsu has a slightly curvy lanky figure type. Her skin is not white, but close. It is more of a pale peach. Her hair is black and shiny, but it is rinsed to be so shiny and silky. Her original hair is a more matte black. Her eyes are a dark brown, to the point of looking black. Out about on the street she wears a gray and black t-shirt covered by a black leather jacket. You can also see her stomach in this. 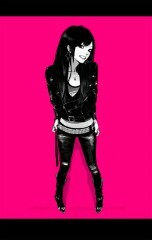 With this she wears black jeans that are ripped, and black boots that go half-way up her calf. She also wears a bejeweled back belt. At work, she wears a clean cut black skirt with a frilled white blouse. Over her blouse is a plain white black dress jacket. Her sleek hair is also pulled back into a bun with a few loose strands hanging in her face. History: There wasn't too many things that were interesting about Hanhan's childhood. She grew up with pretty normal parents who were busy a lot of the time, so she learned to take care of herself from a young age. In order to make up for their absence in her life, Shinji was spoiled with gifts, making her grow up to be a bit demanding and spoiled. Generally, things didn't start to get interesting in Shinji's life until she graduated college. Her father put in a good word for her with several famous people's agents, in hopes that her daughter would get a job as a publicist to help support herself. She first started working out as a coffee girl for an agent of the famous singer Ruri Hijiribe. Slowly, she began to work her way up in the business, before she ultimately ended up as the publicist for Yuhei Hanejima. For whatever odd reason, Shinji took a liking to Yuhei, and acted as a sort of "big sister" of sorts toward the male. Shinji is most often seen around Yuhei, as she prefers being around him than being cramped up in her office. "You have a call on line one Hanran-san." The nasal voice drawled through the phone speaker, having no evidence of any sort of emotional response. Shinjitsu sighed irritably, giving her phone a deep glare before responding. "Alright, thank you. "The young woman replied curtly. There was a brief pause before the line emitted a small "beeping" sound, and it was then Shinji knew that the lined had been switched over. "A-ah, hello? Is this Hanran-san, Yuhei's publicist?" The small voice asked, soft and timid like that of a thirteen year old girl. The elder women rolled her eyes and made a soft growling sound, before huffing in a fit of great annoyance. Fangirls, how she hated these damn fangirls. "If you're looking for Yuhei, I'm not going to give you his contacts. He's very busy and-"
"Wait!" The younger voice sounded, pleading. "It's been kind of tough for me. My boyfriend dumped me, and my parents are getting a divorce. I didn't know what love was until....well until I saw Yuhei-san. I watched every one of his movies, and I know that if you would just give me a chance....I-I know me and Yuhei can make it work." The publicist almost gagged. There were millions upon billions of sob stories she heard from desperate girls trying to meet Yuhei. Frankly, they all made her sick to stomach. If girls were that desperate to get a boyfriend, they should at least pick a target they should hit. "That sounds like a personal problem. I'm not going to give you Yuhei's contact information because you have less than a zero percent chance of being with him. Don't ask me how that's possible, but it is. If you're really that desperate for a boyfriend, pick a target you can hit." And with that Shinjitsu dropped the phone back on it's receiver, feeling not a bit of remorse for being so cruel. After all, she felt as if it were part of her job. Ah, really detailed and very realistic. I feel as if I could actually meet her in the streets. Accepted. Amenoumi has slight matte peach complexion. Her shoulders are broad as well as her torso, and her legs are firm. Overall she is built like a male. She has a small bust, to the point in which she can wrap them lightly and it would be like she never had them. She has black hair that is short cut to her neck and slightly messy. Her eyes are purple, but not naturally. She wears colored contacts, her eyes are naturally dark brown. She wears medium thick rimmed glasses that only are rimmed halfway. Most often she is seen wearing a black and purple striped long sleeved shirt, with regular jeans. She wears black and white sneakers with this as well. She has purple eyes that are framed with black bottom framed glasses. Her black hair hangs a little bit past her neck, with her hair being slightly curly. A part of her bangs hang in the middle of her face, going to her nose, but the rest of it is pulled to either part of her face. 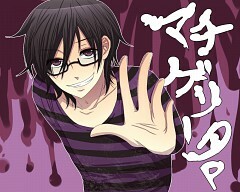 Amenoumi is usually seen with a black and purple striped shirt, jeans, and knee high black leather boots. She has a milky peach complexion, And a boyish build. Her Mother sent her there. She was originally from the Akihabara district of Tokyo. Amenoumi wears two expression most of the time: Either a look of great elatedness and curiosity, or one of undoubted mischief, both of which she lives up too. Generally, Amenoumi has a bright and cheerful personality. She enjoys being around people, and is very sociable herself when needed. One of the traits about her people tend to find peculiar is that she has an unusually high tolerance for people other people would not be able to stand. When confronted by this, she answers simply with, "It's not my place to judge people, so I don't." Amenoumi is not one to annoy or anger easily at all, since very few things annoy her. When confronted with anything that may be annoying or insulting, she tends to deal with it using an extreme amount of sarcasm or biting intelligence. In whatever she pursuits, Amenoumi pursues her goals with an obsessive like drive, probably because success was driven into her head from a very young age. Since she was very young also, she was constantly mistaken as a boy for her tomboyish appearance and small breasts. Eventually, she just began walking around in her tomboyish fashion, curious as to see how long it took people to figure out she was indeed a female. Amenoumi was born in the Akihabara district of Tokyo, but only lived there a year before she had to travel around the world a lot for her father's job. She grew up mainly with her Mother, older, twin, and younger brothers since her father was out and about a lot. Because of this travel, she became well accustomed to many different world cultures, and has at least one souvenir from each place they visited. Finally, she was able to settle down back in her hometown of Akihabara when her parents divorced. She lived there from age 10 to age fifteen, becoming an otaku and electronics nerd since Akihabara is known for it's otaku and electronic culture. At age fifteen her Mother sent her to Ikebukuro to attend Raijin academy and become independent. She attended the academy with Shizuo, Izaya, Shinra, Dotachin, ect. While attending the school, she began to write short stories and post them online for fun, but one of her readers (Screen Name Colorless) encouraged her to go pro and write stories, so she did under the alias 紙のアリス Kami no Arisu, Paper Alice in English. In addition to support herself, she does odd jobs around Ikebukuro for extra cash, and works at a restaurant. I don't see any problems with this character. Just as long as she doesn't personally know the Raijin four. Accepted.